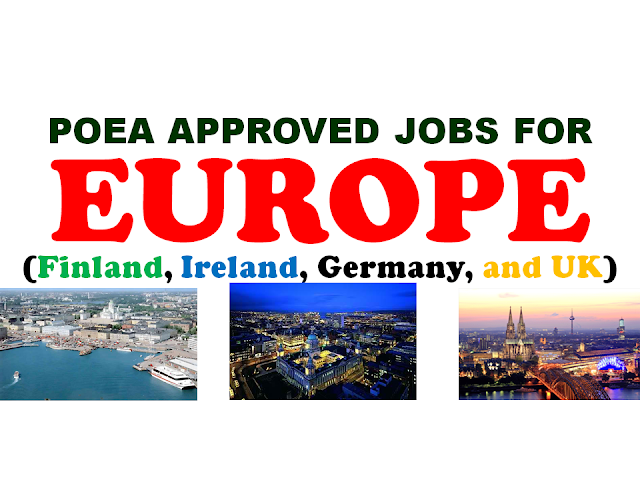 The following are job orders that had been approved by POEA for recruitment to Europe particularly Finland, Ireland, UK and Germany. Each jobs are linked to their respective agencies that will process visa and work permit. Interested applicants may contact the recruitment agency through the contact information provided on the link. As per POEA rule, United Kingdom (UK) and Ireland are among the countries exempted from collecting placement fee. For Finland and Germany, recruitment agency must not collect placement fee exceeding the one (1) month basic salary offered for the job. Any violation on this should be reported to POEA and can be grounds for revocation of agency license.